“Americans are having trouble paying off their credit cards — and it could spell trouble for the economy”. 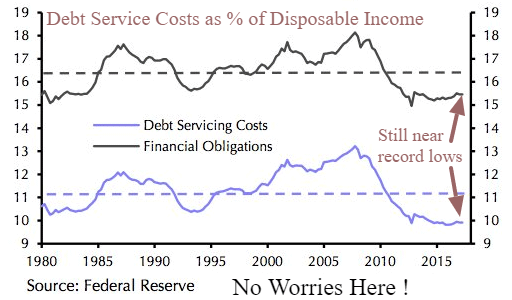 The consumer has been the major reason for the growth in the economy since 2009 (69%) and debt levels are high, but the consumer is not in dire shape as so many attempts to mischaracterize. 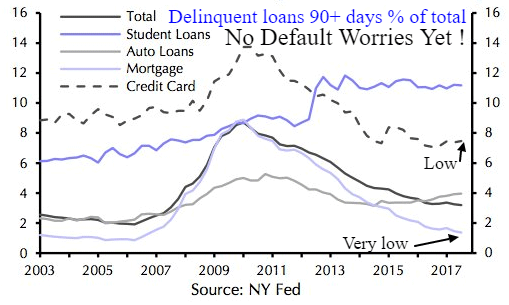 As we have argued for years that consumer debt service levels are extremely low and clearly credit card delinquencies remain near their nadir. There will be a day to worry, but with anxiety levels so far above current metrics, it appears we will have some warning time before rushing for the exits. Credit risk is low, demand for labor is at historic highs, incomes are rising faster and global tends are in the early to middle innings of an upturn. Even the flattening yield curve remains at a very Bullish level. Alarming headlines and calls for a crash sell more headlines than prognostications for more of the same good times ahead. We continue to feel the economy and the consumer are healthy and stock market dips can still be bought over the next year to come. Investors remain 95% invested in equities.